RIO GRANDE VALLEY, TEXAS – JAN. 17, 2017 – Two UTRGV professors have been chosen to participate in a multi-institutional consortium to establish the Western Gulf Center for Excellence for Vector-Borne Diseases, with a focus on Zika research and monitoring. The consortium is funded by a $10 million, five-year grant from the U.S. Centers for Disease Control and Prevention. Dr. Christopher Vitek, associate professor of biology at UTRGV, and Dr. John Thomas, assistant professor of biology at UTRGV, will be involved in the surveillance activities proposed in the grant. UTRGV will receive more than $500,000 over the five-year period, to enhance surveillance efforts in cooperation with local public health and vector-control agencies. In addition, UTRGV will be actively involved in developing a vector biology training certificate program for graduate students at UTRGV. 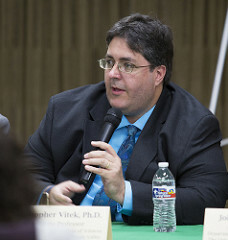 Vitek will serve as the site PI for UTRGV and also will work on the steering committee of the Western Gulf Center for Excellence for Vector-Borne Diseases. 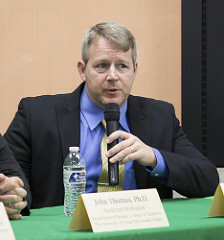 Thomas will be involved in the surveillance activities proposed in the grant. The CDC is awarding nearly $40 million to four consortiums to establish Centers of Excellence that can help address Zika in the United States. The centers will help generate research, knowledge and capacity to enable appropriate and timely local public health action for vector-borne diseases throughout the country. Nearly $10 million each will be awarded to the University of Texas Medical Branch at Galveston, University of Florida, University of Wisconsin in Madison, and Cornell University. UTRGV will serve in the consortium with the UT Medical Branch in Galveston, with Dr. Scott Weaver, interim chair of microbiology and immunology at UTMB, serving as principal investigator. Partners in the new Western Gulf Center based at UTMB will include UTRGV, UT Austin, UT El Paso, Texas A&M AgriLife, Texas A&M AgriLife Extension, Texas A&M Engineering Experiment Station, Vanderbilt University, the University of Colorado and the University of Houston. Harris County and five other local public health agencies and the Texas Department of State Health Services also are participating in the initiative.